Yesterday people were tweeting about a new open-access journal called PeerJ, which at present offers a provocative web page and blog but no solid information. But there's no explanation of what they will offer or how it will be accomplished. Apparently this will be revealed in a few weeks. In the meantime viewers are encouraged to build the buzz by pointing more people to the site. There's a good discussion here about the costs of running a site, comparing it to the ArXiv and to PLoS ONE. Maybe this could be feasible. But for me the big issue is the peer review. Peer review has critical parts that can't be automated or delegated to authors, and if this fails then the journal becomes just another repository for anything researchers want to post. Somebody has to select the reviewers - authors can be encouraged to suggest them, but peer review that depended entirely on the reviewers suggested by the authors would be close to worthless. And getting reviewers to agree to take on a manuscript, and to do the reviewing they promised, takes more than automated emails. And someone with appropriate expertise has to read the reviews and make a decision about whether the manuscript should be published. Is this all going to be done by volunteers? Or is this going to be a journal with very low standards? 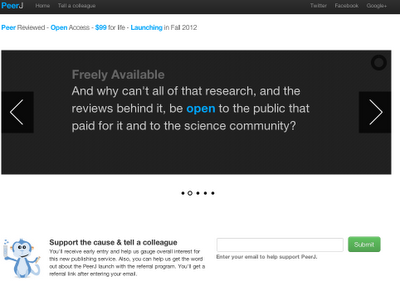 The soon-to-be-former Publisher of PLoS ONE, Peter Binfield, is apparently behind PeerJ. He certainly should know what he's doing, but this combination of spin and secrecy is something I expect of companies looking to make a buck out of the unwary. Update June 13: The PeerJ project was officially announced yesterday. John Dupuis has a big list of links here. Please forgive the silence on some of these issues. Yesterday was not the formal launch of PeerJ, it was simply the day that PLoS announced my departure (which then generated some considerable attention...). We will be formally 'launching' PeerJ in a few short weeks (see: https://twitter.com/#!/thePeerJ/status/200174848423636992) but in the meantime I am still on the payroll of PLoS. I hope you understand, and also understand why I cannot engage yet in debate or discussion about PeerJ. To allay your specific concern, yes all papers will be fully and formally peer reviewed. I currently run PLoS ONE, and PeerJ will operate at the same high levels of quality, integrity, process.